The new Baja International Film Festival starts out with two advantages over most film festivals – an incredibly beautiful natural setting and seemingly endless funding. No expense was spared on lavish parties and events which took place in such scenic locations such as the Wirikuta Cactus Garden and the Puerto Los Cabos Marina and outdoor Art Walk. It further benefits from some of the friendliest and most helpful (and plentiful!) staff I've encountered in over 25 years of attending film festivals. The Festival, which ran November 14-17 in Los Cabos, Mexico, is supported by the Mexico Tourism Board and was co-founded by real estate mogul Eduardo Sanchez Navarro along with twin brothers Sean and Scott Cross (co-founders and co-directors of the Vail Film Festival). Screening 80 films from 18 countries, the Festival opened with the Latin American Premiere of Ariel Vroman's The Iceman, starring Winona Ryder, Chris Evans, James Franco, David Schwimmer, Ray Liotta and Stephen Dorff. At the Closing Night Gala, Edward Norton received the award for Outstanding Achievement in Acting and Michael Apted for Outstanding Achievement in Directing.. Other tribute awards were presented to Melissa Leo, Diego Luna, Virginia Madsen, Nicolas Echevarria and Matt Dillon, who wrote, directed and starred in City of Ghosts, which screened at the fest. 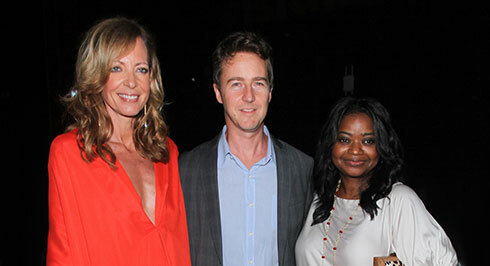 Other guests of the festival included Allison Janney, Octavia Spencer, Giancarlo Esposito, Mike Judge, William Mopather, and Rachel Leigh Cook, among many others. The Best International Feature Award went to the Festival's Closing Night Selection, the Chilean film No, directed by Pablo Larrain and starring Gael Garci Bernal. The Best International Documentary Award went to Bess Kargman's First Position. For more info and full list of awards, go to www.bajainternationalfilmfestival.com. The Baja International FIlm Festival has potential to become a major player on the international festival circuit.